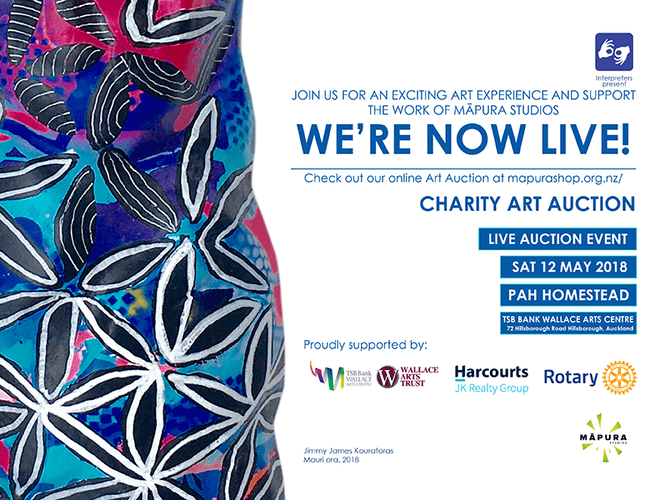 Join us for an exciting art experience and support the work of Māpura Studios. Featuring paintings, photography, sculpture, ceramics, whakairo, rāranga, glass, jewellery and original prints by renowned New Zealand Artists and Māpura Artists. Doors open from 6pm for viewing, drinks & nibbles. Aaron Burgess, Angela Tier, Brett Graham, Crystal Chain Gang, Dawn Harris, Deborah Crowe, Donn Salt, Dorothy de Lautour, Elizabeth Thomson, Evelyn Dunstan, Fran Maguire, Gemma Reilly, Gerri Power, Glen Hayward, Heiwari Johnson, Iain Cheesman, Ingrid Boot, Isla Osborne, Jacqueline Fahey, Jae Kang, Jimmy James Kouratoras, John Parker, Kevin Tan, Kiri Schumacher. Lewis Manuera, Lynette Loye, Lynsie Austin, Matthew Allerby, Michael Nathan, Michael Smither, Michelle Backhouse, Nunu Ama, Peter Cramond, Rebecca Swan, Reva Mendes, Robin Midgely, Russell Julian, Ruth Baird, Shiraz Sadikeen, Stephen Bradbourne, Stuart Shepherd, Trish le Gal, Warwick Brown, Warwick Freeman, Yvonne Manuel.